U.S. Senate Majority Leader Mitch McConnell (R-KY) gestures to reporters after lawmakers struck a deal to reopen the federal government three days into a shutdown on Capitol Hill in Washington, Jan. 22, 2018. U.S. President Donald Trump has signed a bill reopening the government, ending a 3-day partial shutdown that was triggered in part by a partisan brawl over immigration. Late Monday, members of the House of Representatives voted to approve the bill the U.S. Senate passed earlier in the day. The so-called continuing resolution keeps the government funded until February 8 to allow Congress time to reach a longer-term budget agreement. "It's good news for the country," Democratic Sen. Sherrod Brown of Ohio told reporters. 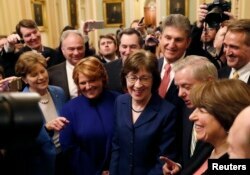 "Today is a day to celebrate," Republican Sen. Susan Collins of Maine said. "When government shuts down, it represents the ultimate failure to govern." U.S. Senators' Susan Collins (R-ME) addresses reporters with fellow Senators' Jeanne Shaheen (D-NH), Tim Kaine (D-VA), Heidi Heitkamp (D-ND), Joe Manchin (D-WV), Lindsey Graham (R-SC), Amy Klobuchar (D-MN) and Jeff Flake (R-AZ). "I am pleased that Democrats in Congress have come to their senses and are now willing to fund our great military, border patrol, first responders," President Donald Trump said in a statement read by Press Secretary Sarah Huckabee Sanders. Trump later tweeted that after a "Big win for Republicans" he wants "a big win for everyone" on those issues. "Should be able to get there. See you at the negotiating table!" he said. The White House argues Democrats "caved" after Trump refused to negotiate with them on immigration policy until the government reopened. Democrats had been holding out for a firmer commitment to provide protections for some 700,000 younger immigrants brought illegally to the United States as children. Earlier, Republican Majority Leader Mitch McConnell of Kentucky reassured Democrats that the Senate would address a range of immigration topics, including hundreds of thousands of undocumented immigrants brought to America as children. "So long as the government remains open, it would be my intention to take up legislation here in the Senate that would address DACA [Deferred Action for Childhood Arrivals], border security, and related issues as well as disaster relief, defense funding, health care and other important matters," McConnell said. Democrats, who banded together to help defeat a funding bill late Friday, signaled a wary acceptance of the Republican offer. "While this procedure will not satisfy everyone on all sides, it's a way forward," Minority Leader Chuck Schumer of New York said. "We expect that a bipartisan bill on DACA will receive fair consideration and an up-or-down vote on the [Senate] floor." 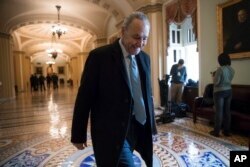 Senate Minority Leader Chuck Schumer, D-N.Y., arrives at the Capitol at the start of the third day of the government shutdown, in Washington, Jan. 22, 2018. Enacting immigration reform will require more than the Senate, however. Action by the House of Representatives and Trump's signature will also be required. The White House has sent conflicting signals on what the president will accept in a final immigration deal. House Republicans, meanwhile, said they are not bound by promises made in the Senate. "What they do inside their [Senate] chamber is up to them," Oklahoma Congressman Tom Cole said. "The Senate's finally doing the job, but that doesn't commit us to doing anything other than what we said," Republican Rep. Chris Collins of New York said. "We will also negotiate [on immigration] in good faith." Democrats, who had been hailed by immigrant rights advocates for drawing a line in the sand Friday, were blasted as weak-willed for taking the Republican deal. "This Congress needs to get a heart and grow a backbone," the California-based Coalition for Humane Immigrant Rights said in a statement. "Democrats need to grow some courage and keep their word. It is a shame the leadership of the Democratic Senate chose to wait one more time to fulfill their promise to the Latino and immigrant community and the country as a whole." 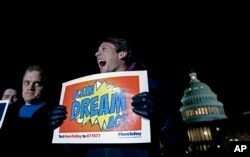 Demonstrators rally in support of the Deferred Action for Childhood Arrivals (DACA), and to avoid the government shutdown on Capitol Hill, Jan. 19, 2018, in Washington. In a statement Congressman Luis V. Gutiérrez (D-IL) complained, "This simply kicks the can down the road with no assurance that we will protect Dreamers [DACA recipients] from deportation or fight Republican attempts to curtail or eliminate legal immigration." President Trump repeatedly accused Democrats of siding with illegal immigrants over the American people, a charge Democrats firmly rejected. On Monday, however, the White House expressed hope for a bipartisan deal on immigration. ​"I don't think there's a whole lot of daylight between where we are and where the Democrats are," Sanders said at a press briefing. "We certainly want to negotiate and get to a place [agreement], and we're hopeful we can do that over the next couple of weeks." The U.S. government's 2018 fiscal year began in October of last year, but Congress has yet to authorize a full year of spending, passing a series of short-term funding measures at 2017 levels, instead. Democrats went along with three extensions but balked at a fourth last week after immigration talks with Republicans and the White House broke down. VOA's Peter Heinlein and Katherine Gypson contributed to this report.